Next Post La vie en rose. I never even thought of a pineapple jack-o’-lantern like that! It’s not a bad idea afterall. Halloween is still quite new to France. There are a few trick-or-treaters running about, but it is not celebrated by everyone. Lovely watercolor! I never thought to carve a pineapple for Halloween. 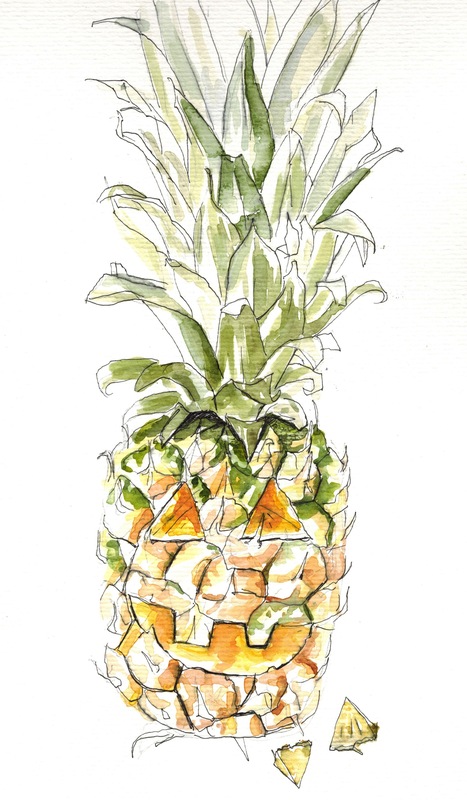 The pineapple….be it a brass door knocker, trivet or a fresh one used in a decoration….means “welcome to my home”. You will find this theme repeated over and over in Colonial Williamsburg, Virginia. What do the French children call “trick or treat” and do they dress up in costumes like the klids here in the states? HAPPY HALLOWEEN !! your watercolors are my absolute favorite in the world.